Good Books Archives - Read. Think. Act. (March 2019) Beth Macy again brings her keen skills in research and journalism to tell another story about Virginia. A long time journalist with The Roanoke Times, she brings to life the stories of Virginia few people have heard before – as she did with her two previous books Factory Man and Truevine. 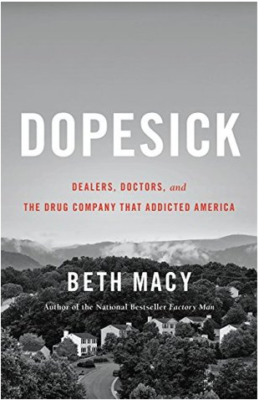 In Dopesick she pulls back the curtain on the genesis of the opioid epidemic that continues to ravage Virginia and the rest of the nation. No longer confined to rural Appalachia where it all began, it has now spread to the white suburban and affluent communities throughout the Commonwealth. Those who were earliest to sound the alarm about the addictive threats of Purdue Pharmaceutical’s new drug Oxycontin were ignored. 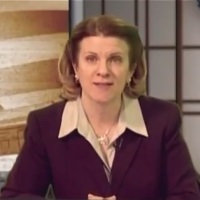 Despite the fact that John Brownlee, US Attorney for the Western District of Virginia, successfully prosecuted Perdue Pharmaceutical for “criminal misbranding” in 2006, that did not sound alarm bells for public health officials or law enforcement. The first successful case against the pharmaceutical company (owned by the billionaire Sackler family) resulted in an award of $634.5 million dollars but failed to signal what was happening in the larger context. Beth Macy details how the drug epidemic followed I-81 north through the Shenandoah Valley. Drugs were being brought into small towns along the route and down into Roanoke from Baltimore on a daily basis by a network of distributors and users. She also covers the detrimental effect of the fight for Medicaid Expansion in Virginia and how four years of Republicans putting up road blocks starved a growing number of addicts of the resources they needed for recovery and rehabilitation. She calls out the role Democratic Senator Phil Puckett’s resignation in 2014 played in handing the Republicans in the legislature the majority they needed to block Medicaid Expansion. Puckett represented five rural counties in southwest Virginia where the opioid epidemic was raging unabated. There is a tremendous stigma around this epidemic because it has struck hard at suburban middle class and affluent white families, as well as poor and rural white families. Drug addiction has turned the corner from simply being deemed criminal activity to being addressed as a disease. It has been a disease all along, but now that respectable people are falling prey to addiction and death from drugs, there is a greater urgency in finding ways to prevent and rehabilitate. The most compelling parts of this book are the stories of the individuals that Beth Macy got to know in the years she spent researching this book. So many lives wasted so tragically. I highly recommend this book to everyone. If your life hasn’t been touched in some way by the opioid epidemic raging through Virginia, it is likely just a matter of time before it is. We all need to get involved in advocating for better resources and programs to meet this crisis that exists in every community in Virginia. (May 2018) This is such a remarkable book. The clue to how good it is comes down to how many pages I read aloud to my husband Tom, punctuated with “Did you KNOW this?” My favorite read aloud section of the book is Chapter Six “Honorary Members.” I learned more about black history in the pages of this book than I have in the last 50 years. Author Tilu Khalayi has amassed the personal biographies not only of distinguished Honorary Members of Zeta Phi Beta Sorority, but also of the very interesting and accomplished young women who founded the Zetas from it’s charter at Howard University in 1920 through it’s amazing national and international charter of chapters to 1935. It’s extraordinary. Full stop. It just is. The style of the book reminded me of an actual college yearbook – personal biographies of the women founders, histories of the individual chapters, the Honorary Members, and Selected Writings and Speeches. Khalayi walks us through the genesis of Zeta Phi Beta as a sister organization of the already established Phi Beta Sigma Fraternity at Howard University. There were already two well established sororities on campus, Alpha Kappa Alpha (AKA) and Delta Sigma Theta (Delta). Zeta was “the first black sorority for which members were selected primarily on the basis of academic achievement.” [Audrey Kerr, Maryland University] Myrtle Tyler Faithful confirmed this, having stated that “we weren’t looking at how rich you were or what you looked like or how you dressed.” Instead the sorority considered young women for membership based on their unique abilities, and the famous writer Zora Neale Hurston is a great testament to that practice. Students had to be academic standouts to get into the Zeta Phi Beta and they had to maintain that academic excellence to stay. The principles that they established as the ideological foundations of the sorority are scholarship, service, sisterly love and finer womanhood. They began with a “Finer Womanhood Week” that became “Finer Womanhood Month” and their annual Boulé meetings held each December featured speakers that focused on that theme of Finer Womanhood and how it is achieved. I was captivated reading about where these young women came from, who their parents and grandparents were, where they went to school and how they came to be at Howard University, and what they did afterward. It is such a window to what the world was like for black women striving to better their own lives and those of other women. And there are all kinds of gems tucked into those biographies. One of the first pledges of the new Zeta Alpha Chapter, Pauline Johnson Phillips, age 17, was the first black valedictorian of any high school in Connellsville, Pennslvania, graduating on June 16, 1917. 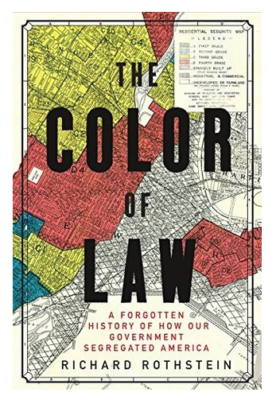 What struck me about this biography was the fact that there were integrated schools in this country before de jure segregation of cities and neighborhoods forced them to be segregated. The local Connellsville Daily Courier reported: “She is the first colored graduate to take honors here and the entire occasion was made very impressive. She received an ovation as she rose to deliver her essay.” Having recently read Richard Rothstein’s The Color of Law I’m infuriated all over again by how this country has perpetuated institutionalized racism with impunity. Annie Turnbo Malone. Holy Cow, how could I possibly NOT know who this woman was? The first profile under “Honorary Members.” She was the Oprah Winfrey of the turn of 20th century America. The first self-made black woman millionaire, she built an empire on hair care products for black women. What an extraordinary woman. She pioneered the business model on which Avon and Mary Kay were built – giving women the opportunity and incentives to sell products and make money. She gave record breaking endowments and donations to Howard University and many other HBCUs, along with numerous charities. She built Poro College in St. Louis that became the center of black St. Louis. Who knew this? Madam Evanti, the famous black opera singer I’ve never heard of. (Her great uncle, Hiram Revels, was the first black person to serve in the United States Senate.) Her race barred her from joining the Metropolitan Opera in this country, but she was celebrated and welcomed elsewhere in the world. She did perform at the White House for three presidents: Franklin Roosevelt, Harry Truman and Dwight Eisenhower and was given a commendation by President Eisenhower for her work with the USO. Nettie Langston Napier. She was considered “The First Lady of black Nashville.” Her father, John Mercer Langston, was the first black Dean of Howard University Law School, and the first black representative elected to Congress from Virginia in a contested election in 1888. Her husband J.C. Napier was a Register of the Treasury from 1911 -1913, and he would go down in history as one of only five black people whose signatures have appeared on U.S. currency. Her nephew was the poet Langston Hughes. See what I mean about a whole lot of history stuffed into a few well crafted paragraphs? 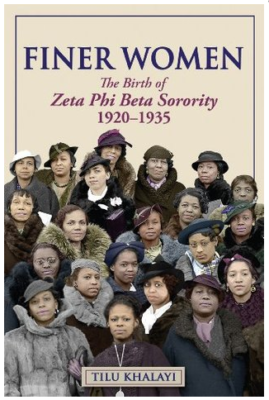 What interested me about this book in the first place is the extraordinary power of black sororities. They are a powerhouse and their influence is fully a hundred years in the making. This was brought home to me by an article in The Atlantic in 2015 The Political Power of the Black Sorority. I see them in the gallery of Virginia’s House and Senate on Lobby Days (they are hard to miss!) and I am in awe of their ability to organize and apply pressure where it counts. This book shines a light on a history I did not know and I enjoyed every minute of discovering these women and what they accomplished. I’ve never belonged to a sorority, but I know quite a few women who are active members of black sororities and I admire them greatly. I highly recommend this book to those who loves American history and are curious about the history they’ve never heard before. (March 2018) A trend is a unique curated observation of the accelerating present. The future belongs to those who can learn to use their powers of observation to see the connections between industries, ideas, and behaviors and curate them into a deeper understanding of the world around us. Preparing for the future starts with filtering out the noise and getting better at understanding today . . . as it alway has. Rohit Bhargava – Trend Curator, Storyteller, Innovater – has been writing about Non Obvious Trends for a decade. They were first published on his blog, then as a visual presentation on Slideshare, followed by an e-book through Amazon, and eventually as a published book starting in 2011. I have no idea how this was not on my radar before now. I picked up this book at the popup bookstore operated by Book People at the SXSWEdu in Austin, TX, earlier this month. This is precisely why it’s important to have a well curated selection of books to browse. Books are put before us through excellent curation that we would otherwise miss. Bhargava sets about collecting ideas throughout the year, marking the hardcopy pages with the salient idea that caught his attention, then he sets them aside in a folder. These are articles from magazines, websites and other resources. He makes it a point to pick up magazines that are wildly disparate in their themes and target audiences – like model train enthusiasts. Curiosity is key here. And having a wide range of interests is also important. We tend to gravitate to the things we enjoy, or impact our business and career, or validate our existing beliefs. Being open to a broad mix of topics helps to elevate trends away from the the specific subject to the behaviors that might be associated across that broad spectrum. I like the way this book is put together. Having never read any of his previous Non Obvious books, it was all quite fresh to me in how he explained his process. He talked about his team and how they went about sorting, grouping and naming emerging trends. And his final trends all have well crafted names – another factor that he sees as very important to helping people understand the trend and what it means. 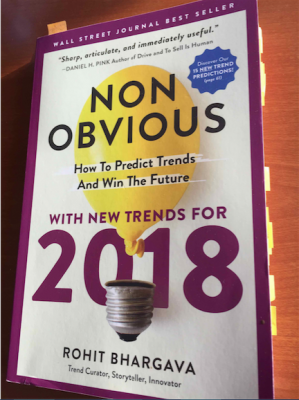 At the back of the book, there is a section where he goes back and lists all of his Non Obvious Trends going back to 2011 and rates how well he predicted their impact. That is very interesting. Each of the 15 trends have their own section where he talks about how he came to identify the trend and wonderful examples of where they can be seen – using varied examples across multiple industries. I was fascinated by Approachable Luxury and some of the examples he used there. I had no idea they are producing quality diamonds in labs now. I highly recommend this book. It’s a very interesting and engaging read. I am of a most curious mindset and I enjoy reading the works of writers who are as well. A gripping memoir. From the opening passage to the final sentence, I was pulling for Tara Westover to make it. 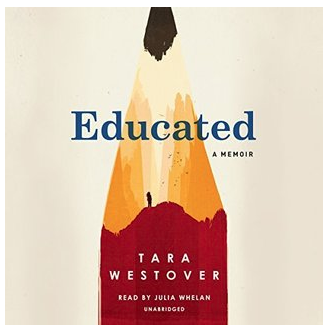 Raised in a Mormon family in Idaho that eschewed modern medicine, public education and was deeply fearful of the government, Tara did herself and the world a great favor by keeping journals from a very early age. The word that kept flashing in my brain throughout this book was “gaslighting.” She was constantly being made to feel that SHE WAS THE CRAZY ONE by her family – her parents, her siblings and the larger Mormon community. Despite never having attended school at all (nor having the “homeschooling” her parents claimed to provide), she managed to enroll in Brigham Young University based on her high ACT score at the age of 17. From that point, she was fortunate to connect with people who recognized her ability and wanted to help her to realize her potential. Those professors and mentors kept opening doors that she walked through to claim her future. At the same time, she kept striving to remain a member of her nuclear family. I never knew what would happen next. It is an emotional rollercoaster. Keeping a journal turned out to be central to this memoir. All of us have faulty memories. It’s hard to be accurate in hindsight when intervening events color our memories of the past. Having a contemporary account of what happened in the immediate aftermath of traumatic events provided a more reliable witness to her life. Perhaps I’m just particularly drawn to memoirs of strong women these days. Tara’s internal struggles to reconcile her life with her desire to stay connected to her family reminded me of Emily Nunn’s memoir The Comfort Food Diaries which addressed similar issues. (Both authors changed the names of their immediate family members to protect their privacy.) Where does our commitment to our family begin, and end, when it impacts our ability to live a full and healthy life? I would highly recommend this book. It is a testament to the triumph of the human spirit in the most difficult circumstances. Our history does not dictate our future. Our origination story is not the only story. We can write a narrative for ourselves that accepts that where we have come from is only part of who we are. Our “self” is in our heads. We do have choices. And self preservation is the choice we have to make first. One of my favorite passages from this remarkable book. 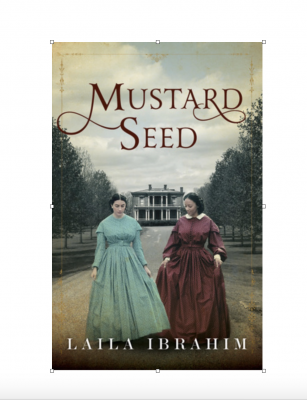 Mustard Seed is a sequel to Ibrahim’s Yellow Crocus, and as historical fiction goes, it’s outstanding. The narrative of both books unfolds in Virginia. And the author captures so vividly the lives of slaves both before the Civil War and the injustices done to them afterward. While attending a session at the SXSW Education conference today on Black Education in America, the very wise Dr. Howard Fuller of Marquette University made this observation: “There is a difference between being liberated and being free.” It sent a shiver up my spine for how it perfectly captured the story of Mustard Seed. In the 1850s, Mattie escapes Fair Oaks Plantation with her daughter Jordon to join her husband Emanuel and their son Samuel who earlier escaped to the free state of Ohio. Returning to Virginia in 1868 to extricate her newly “freed” cousin Sarah from the plantation, Mattie and her family experience some of the most egregious oppressions of Reconstruction. Slavery did not end with the Emancipation Proclamation. Slavery transformed into mass incarceration. As evident in Virginia today as it is in many other parts of the United States. There were moments in this book that made me want to scream out loud. It truly touched a raw nerve after a floor speech by Del. Nick Freitas (R-Culpeper) on Friday, March 2nd, that threw the House of Delegates into chaos. In his remarks are the historic echoes of enraged white men – as if it was transferred genetically from one generation in Virginia to the next. Today, I watched on YouTube as three African American Delegates stood on the floor of that same House chamber and addressed Delegate Freitas’s remarks. Delegates Luke Torian, Delores Quinn and Lamont Bagby pushed back. As they should. 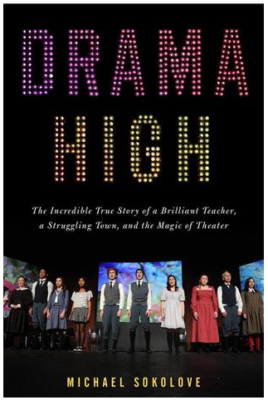 Because the story of what happened in Richmond in the past few days is not so different from the story this book tells. Racism, oppression and injustice is woven in the fabric of Virginia’s culture. Our history does not have to define our future. However, ignorance of our history most assuredly allows past wrongs to go unacknowledged and ignorance to be perpetuated by future generations. Historical fiction has a place in education when it is based on thorough research and grounded in factual and verifiable accounts. You feel what the characters are going through, not just absorbing a recounting of events. I highly recommend this book to anyone who can read and everyone who considers themselves a Virginian. 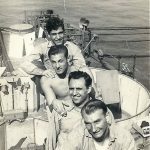 (Feb 2018) People in her family knew Dot [Dorothy Braden Bruce] was doing something for the war, but they assumed it was secretarial and low-level. She could not even tell her mother. 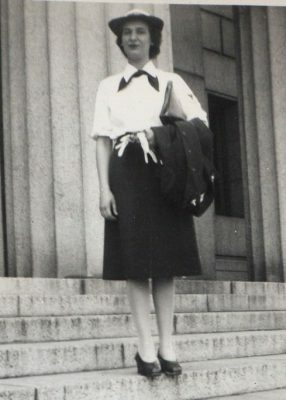 But even as she admired the Navy women’s outfits, it never occurred to Dot that the WAVES might be engaged in the same war work that she was, endeavoring – just as she was – to beat back the fascist menace and break the codes that would bring the boys home. I’m familiar with the wonderful writing of journalist and author Liza Mundy. A long time resident of Arlington, VA, she attended North Cross School in Roanoke, VA, before going on to earn degrees at both Princeton University and the University of Virginia. She is a talented writer who brings to life this amazing story of the thousands of women who helped the Allies win in World War II. All the women who worked on code breaking teams were sworn to secrecy. Even roommates did not talk about their work with each other. And ALL OF THEM were told to say they did secretarial work. On the eve of Pearl Harbor, the U.S. Army had 181 people working in its small, highly secret code-breaking office in downtown Washington. By 1945 nearly 8,000 people would be working stateside for the Army’s massive code-breaking operation, at a much-expanded suburban Virginia venue called Arlington Hall, with another 2,500 serving in the field. Of the entire group, some 7,000 were women. This means that of the Army’s 10,500 person-strong code-breaking force, nearly 70 percent was female. Similarly, at the war’s outset the U.S. Navy had a few hundred code breakers, stationed mostly in Washington but also in Hawaii and the Philippines. By 1945, there were 5,000 Naval code breakers stationed in Washington, and about the same number serving overseas. At least 80 percent of the Navy’s domestic code breakers – some 4,000 – were female. 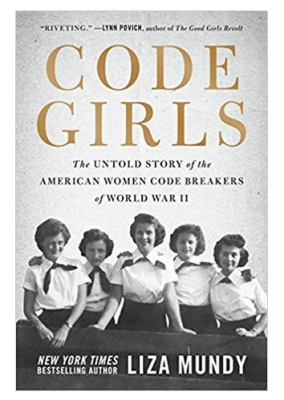 Thus, out of about 20,000 total American code breakers during the war, some 11,000 were women. And they were sworn to secrecy. Which may account for why the children and grandchildren, parents and siblings of these 11,000 women had no idea what they did in the war. This story NEEDS to be told! The comparison to Hidden Figures is justified – why did it take decades for these stories to be told? There is a whole generation of girls who grew up with no idea that women were mathematicians, scientists, technology pioneers . . . and war heroes. In 1942, only about 4 percent of American women had completed four years of college. Both the Navy and the Army recruited these young women right out of their college classrooms in a highly secretive mission where they themselves were not certain of what they had signed up for. They next set their sights on recruiting school teachers from all over the country, as they too showed an aptitude for code breaking work. But as the war progressed and more and more women came to Washington and Arlington, they discovered there was no way to really predict who would be good at this type of work. Administrators were finding to their chagrin that there often was not a correlation between a person’s background and how well that person would do at breaking codes. Some PhDs were hopeless, and some high school dropouts were naturals. There was a stage actress who was working out wonderfully, as was a woman with little formal education who had been a star member of the American Cryptogram Association, a membership group for puzzle and cipher enthusiasts. Code breaking required literacy, numeracy, care, creativity, painstaking attention to detail, a good memory, and a willingness to hazard guesses. It required a tolerance for drudgery and a boundless reserve of energy and optimism. A reliable aptitude test had yet to be developed. The research here is excellent and captivating. The personal stories of these women really shine a light on what it was like to live and work in such an intense time where the lives of their husbands and brothers hinged on how well they could do this work. Liza Mundy did extensive interviews with Dorothy Braden Bruce, a native of Lynchburg, VA, and a long time resident of Richmond, VA. Dot saved the many letters that were sent and received while her future husband, Jim Bruce, was overseas and that contemporaneous account of that era is priceless. This is one of those books that needs to be a “must read” for those who believe they know the history of World War II. That knowledge is incomplete without understanding the contributions of 11,000 women whose stories have never been told. Their contributions to victories like the Battle of the Midway and other pivotal battles of the war, saved the lives of countless U.S. soldiers and sailors. They are truly unsung heroes, many of whom went to their graves committed to keeping the secret of their work as they promised. I highly recommend this book to everyone who can read. (Feb 2018) Genuine listening involves a suspension of self. Holding your tongue while someone speaks is not the same thing as listening. To really listen, you have to suspend your own agenda. Forget about what you want to say, and concentrate on being a receptive vehicle for the other person. Just because something is simple, doesn’t mean it’s easy. 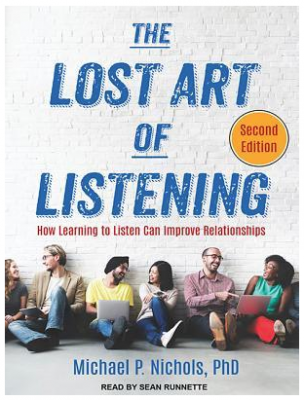 Actively listening is much harder than we believe it is and this book covers the subject from so many aspects. The author is a family therapist and his wisdom comes from years of helping individuals, families and couples to figure out better ways of communicating – which starts with cultivating better listening skills. How we communicate – and listen – goes back to how we learned to do that in our families. Our parents may be the most important unfinished business of our lives. We relate to people in the present on the basis of expectations from the past. We continue to live in the shadows of the families we grew up in. The sometimes vast difference between words spoken and message intended is nothing compared to the often vaster difference between what is said and what it heard. Nichols makes an excellent point about self acceptance as the foundation of being an empathetic listener. When you are trying to figure out why you or anyone else overreacts, keep in mind one of the great ironies of understanding: We are likely to be as accepting of others as we are of ourselves. That’s why those lucky enough to be raised with self respect make better listeners. If you learn to respect other people’s feelings, you will learn to treat your own feelings more kindly in the process. What we can’t tolerate in others is what we can’t tolerate in ourselves. A relationship isn’t some you have, it’s something you do. Sometimes marriage isn’t about resolving differences, but learning to live together with them. Second and third marriages don’t fail because people keep picking the wrong partners. They fail because it’s not differences that matter, but how they are negotiated. If you want the truth from someone, you must make it safe for him or her to tell it. While he addresses listening in the work place in very effective ways, I found the most interesting parts of the book to be about the challenges of listening to the people who matter the most to us – our family members. Ironically, our ability to listen is often worst with the people closest to us. Conflict, habit and the pressure of emotions makes us listen least well where listening is most needed. As we move outside the family circle to those we care about but don’t live with, we tend to be more open, more receptive and more flexible. Primarily because those relationships are less burdened with conflict and resentment. In struggling to figure out just how much bandwidth I have to truly listen to the people I engage with everyday, I’ve come to the conclusion that not every person I encounter needs my full and undivided attention. In fact, there are people who demand attention in ways that mean it’s being taken away from others in my life who are important to me. Social media demands attention in ways that are often overwhelming and many times unproductive. Emails come flowing into several email accounts at all hours, seven days a week, with an immediate response expected. So intentionality is required to make certain that the people who should have our undivided attention are the ones actually getting it. Sometimes it makes sense to write off unrewarding relationships that aren’t central to your life. That is a hard thing to do. Ultimately, saying “no” to that which is unrewarding means leaving more room for that which is rewarding. I found this book an excellent read. If for no other reason, it reminded me of things I know to be true, but don’t always practice. Honing the skill of being an active listener is an endeavor worth undertaking. I was fortunate to hear author Jennifer Weiss-Wolf talk about her book and her advocacy at Bards Alley in Vienna, VA, on Nov. 28th. The next day I was on a panel of women and girls giving a briefing on menstrual equity issues on Capitol Hill in Washington, DC, to legislative staff members in the offices of Senator Tim Kaine, Senator Cory Booker and Congressman Gerry Connolly. Rep. Grace Meng made opening remarks and addressed the strides New York City has made in putting these sanitary hygiene products in public schools, homeless shelters and prisons free of charge. The work of Council Member Julissa Ferreras-Copeland of the New York City Council was instrumental in passing a bill in June of 2016 that was the first of its kind in the country. Two young women on the panel, Ashley (24) and Jennifer (22) talked about their lack of access to needed menstrual supplies when they were incarcerated in jail. (They are both in a Virginia based re-entry program for formerly incarcerated women, Friends of Guest House.) They had to ask guards for pads, and it was up to the guards as to who got how many and when they received them. Requests were handled at the guards’ discretion and at their convenience. Ashley and Jennifer recreated for the hearing room a demonstration of how they made “prison tampons” out of substandard pads because they were more effective than the cheap flimsy pads. Being caught with a “prison tampon” was considered having contraband for which the prisoner could be charged. Weiss-Wolf talks about her own dawning awareness of how many women in this country and around the world are impacted by the lack of access to the basic hygiene products that menstruation management requires. It affects women’s ability to get an education, to work, and to fully engage in productive daily activities. Factors like poverty, homelessness and incarceration leave many women and girls without access to products that are as necessary as toilet paper and soap – which are mandated by law to be in public restrooms. 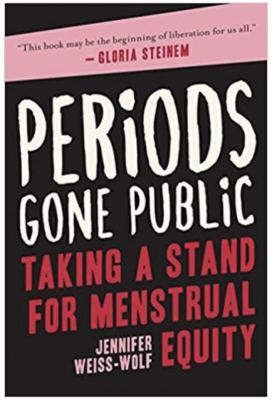 The author talks about 2016 as “The Year of the Period.” From her own New Year’s Day thunderbolt to the Women’s March on January 21, 2017, to the trips she made to other parts of the world to research what was being done to address the issue of meeting women’s basic needs so we can fully function in society every day of the year. Menstrual Equity is on the agenda of cities and states around the country, as well as in countries around the world with populations of women and girls living in poverty. There has been some innovation in place like India around creating small businesses that manufacture pads the poor women can afford. It also creates jobs for them. In this country, there is a movement to roll back “The Tampon Tax” that places another financial burden on top of the expense of buying these products every month Since only people who menstruate use these products, only those people are paying the tax. The book also addresses the fact that transgender men and gender non-conforming individuals also menstruate. We need to move away from the term “feminine hygiene products” and call them menstrual hygiene products. This is less about a gender binary than acknowledging it as an issue of civil rights and basic human rights. Weiss-Wolf also addresses the need to have better testing and full labeling on what is in the tampons women are using. Potentially toxic chemicals or artificial fibers need to be tested and consumer informed. She also points out that there is an environmental impact to providing more disposable products to more women around the world. Even bio-degradable products will take longer to breakdown than the lifespan of the people who have used them. Greater innovation needs to take place around how development menstrual management products that don’t have an adverse impact on the planet. I highly recommend this book as one everyone should read – men, women and children. We need to remove the stigma around discussing periods. Men and boys should understand this very natural and normal bodily function and should support menstruating individuals by advocating for greater access to menstrual hygiene products for those who need them. It is past time for our culture and our society to normalize that people have periods – every month – for most of their lives. I urge being informed and being an advocate on this issue.